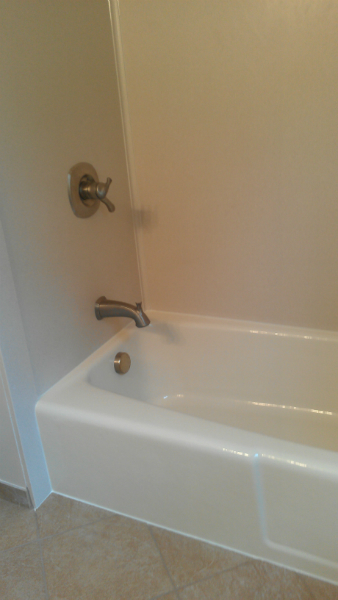 You are here: Home / Our Remodeling Blog / Renew your bathroom with Tub Refinishing! 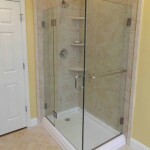 Renew your bathroom with Tub Refinishing! 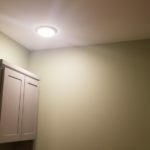 Our goal with any renovation is to do a proper tub replacement, however, there are situations when replacement procedures are not an option. 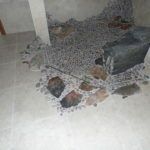 Hiring a professional company to refinish your bathtub will not only give you a nice, brand new finish but save you thousands when comparing the price of tub liners and bathtub replacements. Detailed inspections of the existing subfloor and framing (underneath the tub) are important to decide if the tub can stay in place. Keep in mind, bath tubs with severe damage or deformations are not recommended for a refinish treatment. Many different styles of tubs can be refinished such as Cast Iron and Steel tubs with porcelain or ceramic finishes. This Hall Bath Renovation in Hershey, PA has a Cast Iron tub that was refinished for a color change from mauve to bisque. We installed a new Delta faucet and Swanstone shower surround with the package. 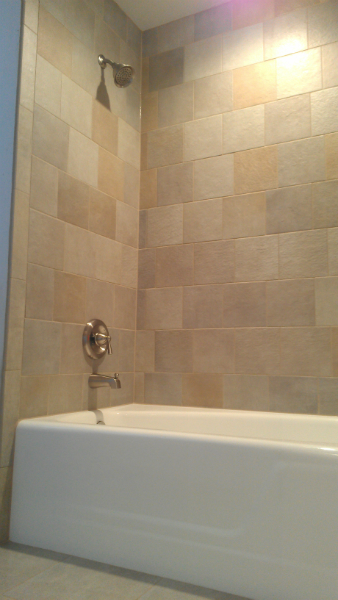 We can also tile your shower walls with a refinishing job! This bathroom was part of a larger (2 bathroom) project in Hummelstown, PA. The walls are a full body Porcelain tile (with a urethane based- stain proof grout), Moen faucets and a bright white tub finish. Bathtub refinishing allows you to upgrade and refresh the existing finish and color with the versatility to match manufacturer colors of sinks and toilets. 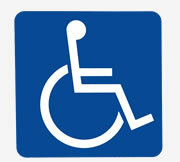 A standard warranty for a refinishing job is 5 years and will last 10 or more years with regular care and maintenance. Although it’s not considered a Lifetime application, your tub can be finished 5 to 6 times to meet the cost of one tub liner. This is a good way to avoid the hassle of water and moisture leaking “between” your existing tub and a liner which causes mold, mildew and damage to your home (if not serviced immediately). The refinishing process is very detailed and much more durable than the “DIY” kits available at local home centers. The process takes one and a half days due to the preparation and cure times of the finishes. 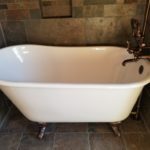 The bathtub first needs to be scraped down, caulking removed, sanded and treated with specially designed etching primers that will remove the smooth finish so the primer and top coats will adhere properly. Any divots and deep scratches can be repaired with a special compound to renew the surface. When preparation is complete, 4 coats of an epoxy based primer are applied as a bonding agent to the tub and for the finished coats. Multiple top coats of a urethane based- acrylic glaze (dried in between each treatment) are then applied. These coats are sprayed on with a high volume, low pressure HVLP turbine system. The bath tub must not be disturbed overnight while curing. The following morning, all touch ups, buffing and shining will take place before we reveal your newly refinished bathtub!